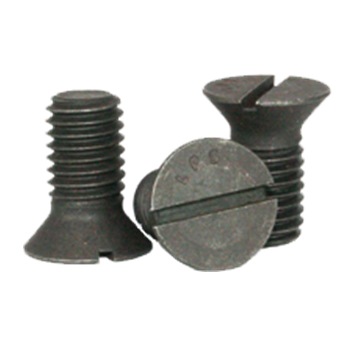 Flat Slotted Cap Screws are countersunk screws with a flat top surface, milled slot, and a conical bearing surface with a head angle of 82 deg. They are used for assembling close tolerance machinery where head clearance is critical. Flat Slotted Cap Screws are available in diameters from 1/2" to 1" and lengths up to 6" long.